A 5.8 earthquake hit the East Coast, Tuesday afternoon, alarming people from South Carolina to Maine, and causing not much damage. Frightened office workers spilled into the streets in New York, and parts of the White House, Capitol and Pentagon were evacuated. There were no immediate reports of deaths, but fire officials in Washington said there were at least some injuries. When more bad economic news comes in the months to come, no doubt we can count on Obama to blame the great DC earthquake, (among many other natural disasters and favorite right-wing bugaboos) for our fiscal woes. Beltway Confidential posted some of the best twitter jokes about the quake. R.S. McCain interviewed one of the young victims of the quake (who happens to bear a striking resemblance to McCain) and instituted the Earthquake Victims Relief Fund (which bears a striking resemblance to his…. tip jar). 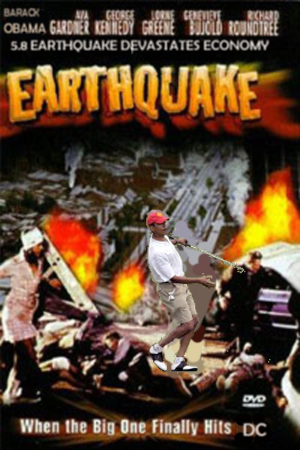 Another earthquake photoshop at iOWNTHEWORLD: Washington D.C. Earthquake – Bush’s Fault-line. This, just like Katrina, was GW’s fault, too, and is simply one more piece of bad luck he is forced to deal with. After he gets back from vacation, of course. And it won’t be easy, either, what with all them recalcitrant Repubs refusing to budge an inch because they’re so ideologically stuck on bringing him down ’cause they’re such raaaciiiists! Not like him, though, ’cause he’s bent over backwards trying to get them to see the error of their ways and the absolute brilliance of his plan which, BTW, if changed one iota won’t work so he’s gotta stand strong and not make concessions to those evil raaaciiiist! Repubs. If he were swimming, I’d call him a “floater.” Since he’s not, I just think of him as a vacationing piece of pig poop. Earthquake, Hurricane … Frogs and Locusts Next? The next time I do something like forget to put the ‘e’ at the end of ‘Maine’, would someone please tell me so I can fix it? Gah! Thanks for the linky love, Deb. Up here in New England, we’re down to the canned food and the cats are starting to look mighty tasty. But, we know that FEMA will be here soon to give a nice, safe plywood trailer home, so our spirits remain high [so does our neighbor Poncho].